Left to right: Sammantha Brown, 9, Santa Claus, Ann Brown and Van Brown (18). 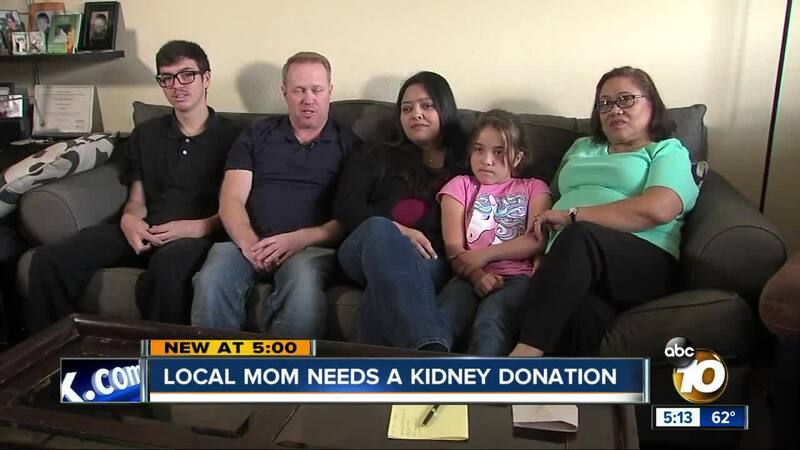 SAN DIEGO (KGTV) — A San Diego woman is calling for the community’s support and the power of social media to find a match for her kidneys. According to “Donate Life,” nearly 20,000 people need a kidney transplant in California alone, and the number of registrants grows every day. 38-year-old Ann Brown has been married to husband Jason for 20 years. The couple has two children: Van (18), who was recently accepted into the US Navy, and little Sammantha (9). The family has always enjoyed taking vacations, and going to the beach and mountains. But that all stopped seven years ago. “He asked how long I had polycystic kidneys and I’m like, ‘Excuse me?’” said Brown, recalling a routine visit to the doctor. That day, the Brown family found out that Ann had stage three kidney failure. Both of her kidneys were riddled with inoperable cysts, becoming much larger than normal. Nearly a year ago, Ann was placed on the kidney donor registry, but so far, has been without a match. “My husband was going to donate to me, but he wasn’t a match,” Brown said. “It makes me feel helpless I can’t do anything,” said her husband, Jason. With a rare B+ blood type, only those with B or O types can even attempt to donate to Ann. Her high antibody count also makes her case extremely hard to match. “Doctors said only 10% of the population could even donate,” Brown said. The only thing keeping her heart beating is the massive dialysis machine in the master bedroom. Doctors told her that waiting for a cadaver kidney match can take up to ten years. With no live donor in sight, the odds are not good. Jason set up a Facebook and website and even had son Van share the links to his favorite professional athletes and social media influencers. But they still got no responses. The Brown family exhausted all resources. At a recent photo op, 9-year-old Sammantha even asked help from Santa Claus. “I asked him for a kidney donor for my mom,” Sammantha said. Brown said she was caught off guard. Her daughter’s wish moved her to tears. Sammantha also wrote a card to her mother. The family is hoping for a Christmas miracle to give Ann a new lease on life. “I’m just hoping someone has a good heart, and give us the most beautiful gift that anybody can have. Gift of life,” said Ann’s mother Elizabeth Graves. More information on Ann’s story can be found here . To register to the UC San Diego Health Kidney Transplant Program, click here .